In the year 1450, which was called a Jubilee Year by pope Nicolas V, many people went to Rome to receive ‘groote paroene’, or full indulgence. Among them was John I, Duke of Cleve and Mark, who together with several nobles in his train, travelled to Rome and also visited the Holy Land. In the same year, his brother-in-law, Arnold of Egmont, duke and count of nearby Guelders and Zutphen, made the same journey, during which the companionships met in Rome. In my research I investigate the social and religious networks of the nobles in the Low Countries at the end of the middle ages during their pilgrimage to Rome and the Holy land. The pilgrimage of the counts, mentioned above will be the subject of my case study. The pilgrimage of John I, was penned down by his court chronicler in the ‘Chronik von Kleve und Mark’. In this primary source it becomes clear that the pilgrimages was not just made for getting an indulgence but that making a pilgrimage was a family tradition as well, during which male family members travelled to Jerusalem for receiving the knighthood, after which one was taking in to the order Ordo Equestris Sancti Hierosolymitani (the order of the Holy Sepulchre of Jerusalem). Besides keeping the religious duties of this order, it also prestige for the noblemen. Receiving the knighthood was an important alternative for the quick form of being knighted on the battlefield. 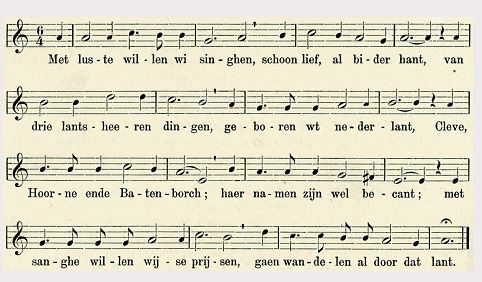 It is striking that the song that was made about the knighthood of the Duke of Cleve, was still known in 1544 and included in the Songbook of Antwerp, entitled ‘Met luste willen wi singen’. 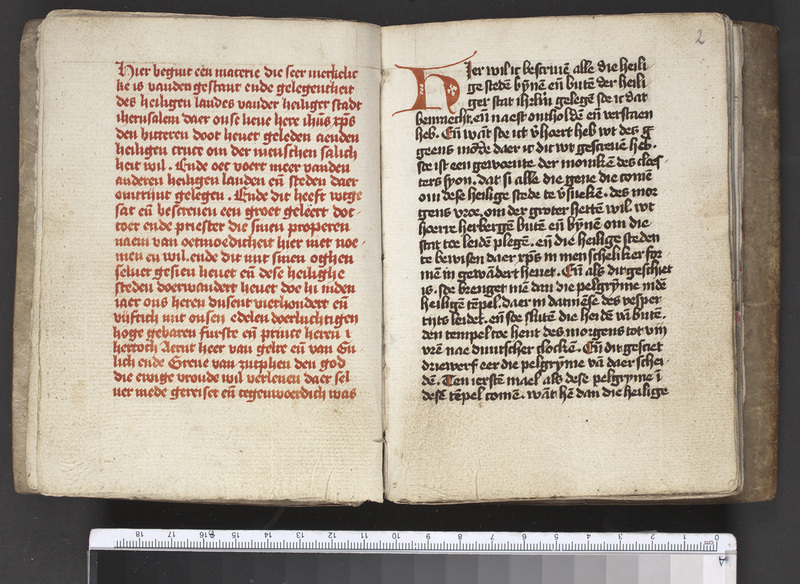 The other primary source with I researched for my survey and used is the manuscript ‘Van den gestant des Heiligen Landes', in which an unnamed doctor and priest, who according to himself was in the company of Arnold of Egmont, makes an account of this pilgrimage. This manuscript is somewhat problematic, because it is not a common travel account and which was from the very beginning meant for a nunnery, which is not more fully specified. Researches see this travel account as a means for the sisters, who could not actuality go the Holy Land themselves, to make a kind of virtual pilgrimage. The point of discussion is whether the description of this trip is authentic (according to Nijsten), or whether it is a copy of another handwriting (as suggested by Rudy). Rudy didn’t actually research it and in my paper I try to prove that in fact it is a copy. For both dukes it was evident that one couldn’t simply start travelling all of a sudden. They both experienced a tumultuous period of upheaval and warfare. Johan I was ‘sonder enige veeden avan ymants anderswegens in guedens vreeden and rust’ after a war with the archbishop of Cologne and Arnold of Egmont’s trip was also inspired to ease the tension and the grieves of the subjects against their lord. Both man left theie dukedom in the hand of family members. Arnold van Egmont had his wife Catherina van Cleve (famous of the Book of Prayer) oversee it, being assisted by the Counsel of Sixteen. Johan I visited the city of Brussels, by the start of his journey, where his ‘lieven Oemen’, Phillips of Burgundy, lived. It is known that Phillips supported both dukes and had great political influence in the nearby regions. During the pilgrimages there was some contact with the homefront. Diverse sources informer that the cities of Gueldern sent messengers to Italy to inform after their lord, during his travels. The chronicle also gives information about the route that was takien to the Holy Land. Looking at the cities that are named in the chronicle, Duke John I possibly used a route Via Francigena, the old pilgrims’ route from Canterbury to Rome. He made this trip with his fellowship on horseback. As so many pilgrimsges he took a ship in Venice to sail to Jaffa. From Jaffa the company traveled on donkeys to Jerusalem. In contrast to the comprehensive tradition in the handwriting, the court chronicler used six lines to discuss the visit of the holy places of Jerusalem. In all probability one was guided around by the monks of the monastery of Zion. The chronicle describes in pretty much detail who was included in the company of the Duke. It is striking that some noblemen from the company of the Duke of Cleve were subjects of the Duke of Gelre. There was for example Dirck Batenburg, bannerheer and advisor of Arnold of Egmont. The following persons, all being lower or no noblemen, also travelled with the Duke: a chaplain, a room servant, a cook, a drum player, a barber, and three servants to work at the court. This was a rather small company, compared to the large number of people that normally speaking accompanied the duke (minimally 200 persons). While being underway Duke Johan I used his connection in his knightly networks. The court chronicler writes about his several-day stay in the palace at the Doge of Venice. On Rhodes they were hosted by the knightly order of St. John. The chronicle also mentions the ‘honest reception’ by the king of Cyprus. The reception by the king of Naples and the two-week stay with delicious meals and drinks and costly gifts are penned down, just like the stay with a cardinal in Rome. Not much is told about the contacts with Muslims and Jews in the Holy Land. The chronic only mentions the warning for swindling and robbery of rich nobleman by the ‘heyden’ (gentiles). On the other hand they rented donkeys of these people to travel to the Holy Land. In the manuscript the auteur deals with the ruining of churches and buildings, possessed by gentiles. After paying something one could visit these. The connections of Arnold of Egmont and ‘the common sisters’ are not totally odd. At the court of Gelre were many clergymen; the chaplain, worked as a secretary and spiritual overseer. The court of Gealdern had links with diverse monasteries and churches in its neighbourhood where several manuscripts were written and decorated for the court. Schüren, Gert van der. Chronik von Cleve und Mark. Trans. by Ludwig Tross. Hamm: Schulz und Wundermann, 1824. Vanden gestant des Heiligen Landes. KB 75 H 36. Rudy, Kathryn M. Virtual Pilgrimages in the convent. Imagining Jerusalem in the late middle ages. Turnhout: Brepols, 2011. Nijsten, Gerard. Vanden gestant des Heiligen Landes. Op zoek naar een vijftiende-eeuwse auteur en zijn publiek. In Die fonteyn der ewiger wijsheit. Ed. by P. Bange and P.M.J.C. de Kort, Middeleeuwse studies, vol. V. Nijmegen: Centrum voor Middeleeuwse studies, Katholieke Universiteit Nijmegen: 1989, pp. 82-96.